Everyone has a set schedule that they keep in order to accomplish daily tasks in their lives. However, when it comes to waking up in the morning, it’s either setting a handful of alarms on the phone or using an alarm clock. Either of these methods will leave you tired, groggy, and start to hate mornings. What if we told you there is actually an alternative? A wake-up light uses light instead of sound to wake you up. It will slowly ease your brain into waking up by gradually turning up the brightness of the light bulb over 30 minutes. This gives your body enough time to process and wake you up. To help you find a good wake-up light, we will be reviewing the top five wake up lights of 2019. Waking up to jolting alarms is no way to start the day because it creates tension in your body. The Philips Wake-Up Light works with smart technology to help slowly stimulate your natural ability to wake up. There are multiple light settings that not only work during the morning but can also be used as a nightlight. 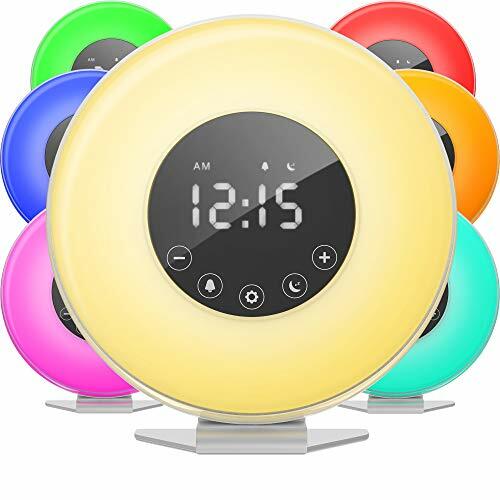 It also combines the functions of a regular alarm clock such as an FM radio, a large LED screen, and sounds. Sunrise simulation: Using natural lighting that simulates the sunrise, this wake-up light gradually increases the brightness of the light for 30 minutes. This mimics the natural sunrise you’d find in nature, allowing your body to wake up at a safe pace. The bulb is designed to mimic the same hues and colors as the sun. Light settings: Adjusting the brightness of the light can help you wake up either quicker or slower since each person can change the sensitivity to their liking. There are ten different light intensities, each of which can go up to 200 lux. Bedside lamp: During the night, the light provides a dim lit sunset lighting which can help relax your body before you sleep. As you’re getting ready to sleep, you may turn off your bedroom light. This will activate the system to adjust the brightness levels to put you to sleep. Extra features: One of the major benefits of an alarm system is the ability to hit the snooze button. The Philips Wake-Up Light also includes a built-in snooze button which delays the alarm by nine minutes. On top of that, it features non-slip rubber feet which prevent the system from being knocked off your nightstand. Out of many available sunrise systems, the Philips Wake-Up Light features the most settings. You have the chance to personalize up to 20 different brightness settings, enabling complete customization of your experience. Choose the sounds you want, what brightness you’d like to wake up to, and when your alarm goes off. The buttons inlcuded on the Philips Wake-Up Light tend to be hard to hit, as they are located on the side of the device. Users state that the buttons are too small, but this prevents accidentally hitting them while you’re trying to hit the snooze button. However, changing the settings is near impossible unless you’re awake and focused on what you’re doing. This sunrise alarm is designed to be in tune with our internal body clocks. With advancement in modern life, most technology messes with our body’s natural ability to go to sleep and wake up. The Ayyie Wake-Up Light helps restore our circadian rhythm to normal and keeps us feeling awake during the morning and sleepy at night. Sunrise stimulation: Set your alarm clock and 30 minutes before your alarm goes off the sunrise function will begin to activate. It spreads a warm LED light that will slowly start from 5% brightness all the way to 100%. This helps lull your body out of sleep and makes you feel more refreshed and energized. 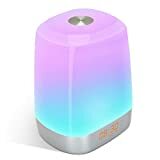 Multi-color and settings: The Ayyie Wake-Up Light enables you to change the color of the light to your liking. Adjust between the different colors and hues to set a specific mood. Use the adjustable table lamp feature to sort between three different brightness levels quickly. The touch panel on top of the device quickly responds to your touch, enabling you to switch brightness levels in an instant. Natural sounds: Instead of a blaring alarm noise, you can now hear sounds that would typically be found in nature to signify the start of a new day. The alarm system features five alarm noises namely Thrush singing, kingfisher singing, cuckoo, waves, and a thunderstorm. 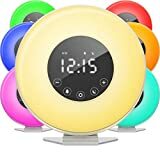 This system is an excellent match for those who struggle to get up in the morning, as it provides them enough stimulation to wake up at a reasonable pace. Rechargeable light: Charge the emergency light via USB port. The battery is a 3600 mAh built-in lithium battery which can connect to your computer, TV, or power bank. Use this light in the time of an emergency such as a power outage or if you need a flashlight. The lamp has more uses than just to wake you up. Use it as an atmosphere lamp, for reading, or alarm clock. The Ayyie Wake-Up Light’s design is very sleek and modern, and the different colors can be adjusted to set the room. Overall, this is an excellent wake-up light that enables you to adjust the settings to your liking. Unfortunately, you can’t adjust the loudness of the nature sounds. This may be irritating for light sleepers, as there is only one volume setting for the sound alarm. Some state that this is too loud and jarring for their mornings. However, deep sleepers may appreciate the extra loudness. The Sunrise Wake-Up Light features a new solution to helping you wake up in the morning. It uses a sunset simulation which can help mimic the natural appearance of sunrise. The alarm clock also will emit a mellow light which will brighten over time. This gives your body enough stimulation to wake up slowly throughout 30 minutes. Sunrise alarm: Jolting alarm clocks cause your body to wake up quickly, leaving you unnerved and tense. With the sunrise alarm, 30 minutes before the alarm goes off, the light will start from 0% brightness. It will then gradually adjust to 100% brightness, and then the sound or radio will play for two minutes. Natural sounds and radio: There are six sounds that you can choose from to wake up to. Switch between chirping, beach waves, music, classic beeps, and much more. Use the FM radio to keep yourself awake, in that way, you don’t repeatedly hit the snooze button. Adjustable colors and brightness: Another feature is the ability to switch between seven different colors and multiple brightness settings. Switch between six different colors and adjust the light from dimly lit to full brightness with ten different brightness settings. Other features: The clock integrated displays 12- or 24-hour times with a touch control panel. The snooze function makes it easy for you to sleep for a bit longer if needed. Utilize the sunset simulation sleep light to help lull yourself to bed at night. Also, use the device as a radio and listen to any FM station. Out of most of the wake-up lights, the Sunrise Wake-Up Light has to have the best color options. Adjust the colors to your liking by either having them change or stay constant. Either way, this product can blend in well with any room. The light at full brightness can be a bit harsh on the eyes. If you happen to have sensitivities, then it’s suggested to adjust the settings. However, if you tend to stray away from super bright lights because your eyes are sensitive, then we recommend looking elsewhere. Standard alarm clocks can be jarring and are meant to scare us out of our sleep. Instead, we should wake up into our mornings with a replica of a sunrise. It would be a more natural process that we would be utilizing if we lived in nature. 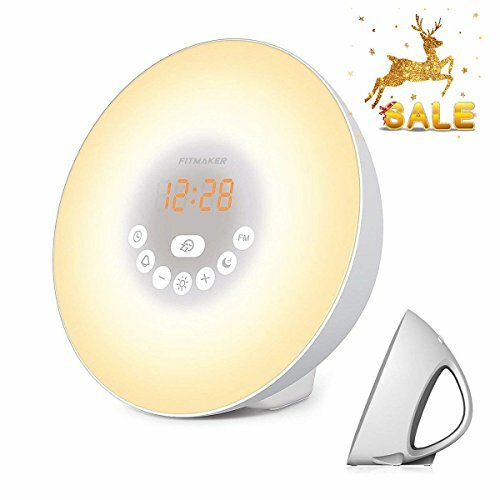 Over time, this alarm clock will awaken you with its soft glow paired with modern features. 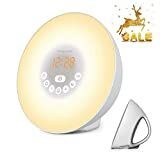 Natural sunrise alarm system: This device uses a warm LED light system which slowly begins to brighten over 30 minutes. By doing so, it stimulates your bodies natural ability to wake up, enabling you to feel refreshed and awake. Additionally, it works as a sunset system, which can help put you to sleep. Alarm designed for heavy sleepers: Learn to slowly wake up to nature-inspired sounds to help keep you awake. The traditional alarms can be very jolting, causing you to start your day bad. Instead, focus on sounds found in nature to help start your day. The alarm works great on heavy sleepers, as it’s very loud. LED color options: There are eight different color options which can change the mood of the room. Use this as an alarm system or as a bedside lamp. Either way, it emits vibrant colors onto your walls and helps you feel calm and collected. Switch between green, purple, red, blue, and yellow. Natural sounds and radio: Switch between natural inspired sounds or choose to use the traditional FM radio to wake you up. The nature-inspired sounds range from birds to ocean waves, while the FM radio will play any music from your favorite music station. Digital clock system: The digital clock system switches between the regular 12-hour clock and the 24-hour clock. It uses a big LED which is operated via touchscreen. You’ll be able to change the time, brightness, and other settings through here. The fact that the HomeLabs Sunrise Alarm Clock can awaken heavy sleepers is a big plus. Many of us sleep through our alarms and end up missing work. With this sunrise alarm system, you’ll never wake up in a panic. The sound quality of the HomeLabs Sunrise Alarm Clock isn’t the best on the market. While the sounds may be loud and will wake you up, they sound as if they have an echo. If your ears are sensitive and you enjoy high definition sound, we recommend to skip this model. If you’re searching for a sunrise alarm clock for your kids, then look no further. This cute design mimics a bug and is cheerful enough to start your child’s day right. The Mirari Ok to Wake teaches your children how to wake up slowly and keeps them from being grumpy in the morning. Parental controls: It’s important to keep the settings intact, as kids love to mess around with technology. As a parent, you’ll be able to change the settings for the night light, green light, and alarms. The buttons are securely located on the bottom of the device, which prevents little kids from changing them. Fun: The alarm system features two kid-friendly buttons that are easy to press and activate. A child often has a hard time with alarms as it will require them to understand which buttons to push. The first button is for a snooze, and the other is to turn the light off. Settings and faceplates: You’ll be able to change the digital clock, brightness, and glow of the device. To keep the device from becoming boring, you can also change out the faceplates which enable the bug to look happy. This keeps your kid refreshed and interested in the system. It’s hard to find a sunrise system which is designed for children. The Mirari Ok to Wake is recommended for ages three to five, or those who are just learning how to wake up in the morning. It’s hard for young ones to start their day, but with a fun toy, they will be more eager to hop out of bed. The downside of the Mirari Ok to Wake is that it runs on batteries and will need to be replaced every so often. It would have been more of a modern device if it could be plugged in or recharged. A simple fix to this is to invest in some rechargeable batteries, that way you don’t spend extra money powering the device. After reviewing five great models, we will introduce you to the different buying considerations. If you’re looking for the best wake up light, then you may want to consider looking for these features. Each of these features should be present in a wake-up light you’re considering. However, not every wake-up light is the same, so at least try to find three of the features. Being able to adjust the colors enable you to match them to your room. Set a mood, match it to your furniture, or fix it to your favorite colors. It can be boring having the standard yellow light. Some LED lights even keep you awake. Using colors can keep you feeling refreshed and happy. The traditional beeping of alarm clocks can be jolting and leave you feeling tense. Instead, focus on finding wake-up lights that use natural sounds or music. This way, you won’t be scared awake every morning. Alternatively, you’ll peacefully wake up to sounds commonly found in nature. Snoozing should only be considered if you’re the type of person who needs a bit of extra time to wake up after the first alarm. Instead of having to set multiple alarms on your phone, press the snooze button. This will delay the alarm by two minutes or more, which gives your brain more time to wake up. Some don’t enjoy the sounds of nature and prefer to wake up to music. If this suits your style more, then consider finding a wake-up light with an FM station function. You’ll surely be able to wake up to your favorite tunes each morning. Lastly, the brightness of the sunset can also affect how you’re feeling in the morning. Some sunrise alarms are too bright at 100% and can be uncomfortable to wake up to, so focus on finding one where you can adjust the brightness level. This will save you from having to be blinded by the light every morning. 1. What Are Wake-Up Lights? Wake-up lights are also known as sunrise alarm clocks because they naturally mimic sunrise and sunset. Our bodies do better waking up slowly over the course of 30 minutes. A wake-up light will gradually increase the brightness of light until it reaches 100%. This will help stimulate our brain and start our day relaxed and calm. 2. Do Wake-Up Lights Work? Yes, wake-up lights are effective at stimulating our bodies to wake up naturally. In the wild, animals and other mammals rise when the sun starts to rise. However, many people skip the fact that humans function the same way. It’s more effective to start a day with a wake-up light than it is with a jolting and loud alarm. 3. Are Wake-Up Lights Worth It? It truly depends on what type of sleeper you are. Some people do well with multiple alarms set and use their phone while others enjoy slowly taking their time waking up. That being said, we believe that everyone should try a wake-up light to determine if it’s their cup of tea. 4. Are Wake-Up Lights Effective? There are benefits to using a wake-up light. The first benefit is that it corrects your circadian rhythm and stimulates your body’s cortisol levels. This will help you feel stronger, more alert, and remove the morning grogginess. The second benefit is that it can help balance out our body’s natural ability to produce melatonin. This is an important chemical that your body produces to put you to sleep. Melatonin production is stimulated through light, which means using a sunrise and sunset setting can keep those levels balanced. Lastly, they can prevent you from feeling depressed during the off seasons. It’s not uncommon for those with a seasonal affective disorder to be depressed when the sun doesn’t rise naturally in the sky. By simulating the process with a wake-up light, you can lower the effects of the seasonal affective disorder. 5. What Is a Sunrise Alarm Clock? A sunrise alarm clock is a type of alarm which stimulates your body to wake up with sunrise. The light mimics sunrise by slowly turning up the brightness over some time. This will help your body slowly wake up with the light. On top of that, it will then set off an alarm which will either be music, natural sounds, or traditional beeping. There are so many wake-up lights on the market that it makes it hard to find one that suits your needs. Looking through all the features, pros, and cons, the best of the best wake up light on our list would have to be the Ayyie Wake-Up Light. It features a lovely design which can blend into adult or children’s bedrooms. It also includes a wide range of settings, snooze, and natural sounds which help wake you up. Overall, these features are what make it our favorite and would surely match the needs of most users.